Jacksonville, NC Bojangles'® Tands, INC. Store #20 - Bojangles'® / Tands, Inc. 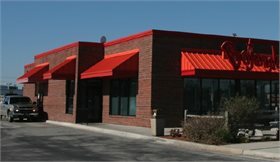 This Jacksonville Bojangles’® location is near all of Jacksonville’s shopping and retail on the Western Blvd Extension. Stop by while running errands or shopping to fill up on all the your delicious Bojangles’® menu favorites! If you have a hankering for cripsy fried chicken, our made-from-scratch biscuits or the bold taste of our fixin’s—it’s Bo Time! For breakfast, lunch or dinner, Bojangles’® can fill you up and satisfy your cravings.